Certain apps tend to forget to clean up after themselves when they’re uninstalled. Which is why, after testing and uninstalling apps for a while, many Android users find their SD cards cluttered with app residues. 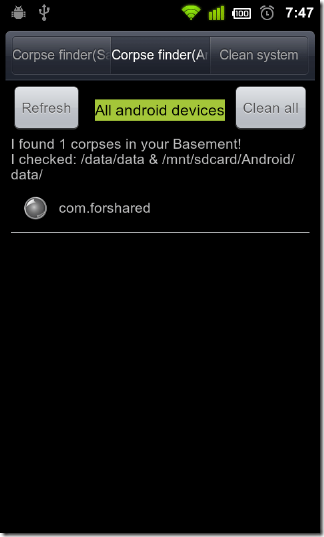 SD Maid is a free, handy system cleaner tool for rooted Android devices that not only helps you get rid of said residues (fittingly termed “corpses” in the app’s UI) but also keeps your internal memory squeaky clean. The freeware allows you to scan for and clean discarded or unwanted files/residues on your SD card as well as temporary files, cache files, logs and more from the system. SD Maid scans for residues in the /data/data and /mnt/sdcard/Android/data/ directories common to all Android devices and those in the /dbdata/databases/ directory exclusive to Samsung Android devices. Tap Refresh from within the respective Corpse finder tab to scan mentioned directories. Corpses can be deleted selectively by tapping scan results one by one or all at once by tapping the Clean all button. The Clean system tab allows you to scan (selectively/collectively) for and clean unwanted system files, which, as of this writing, include logfiles, stacktraces, caches, incomplete downloads, temporary files, Windows thumbs.db, Windows desktop.ini, MacOs .DS_Store, MacOS ._* files and gallery thumbnails. The app does not scan for all mentioned files by default. To add or remove files from the Clean systemscan list, hit the Menu button and tap Settings. You can grab SD Maid from the Android Market via the provided link or scan the QR code.